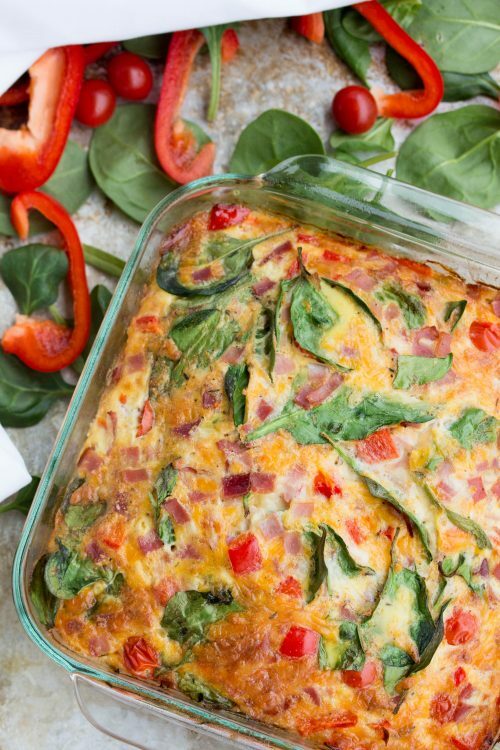 Oh my goodness, you guys, is there anything better than a breakfast casserole? Ok, I realize it may not be high on your list of breakfast yummies, or even on your radar. Well, it’s time to change that. 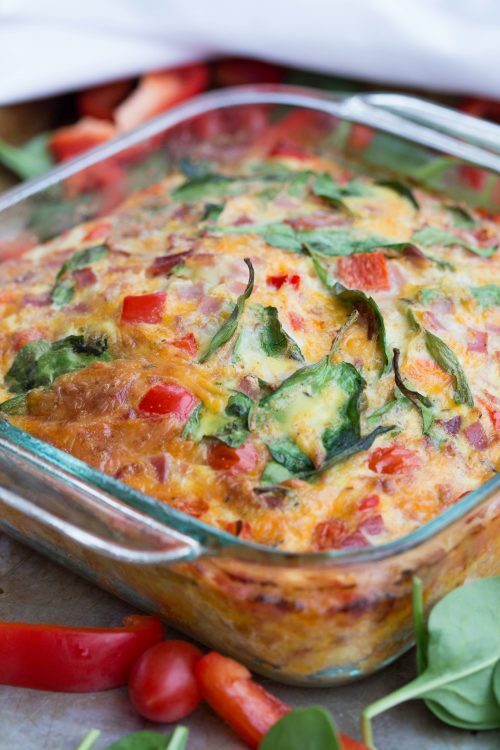 This amazing ham and cheese breakfast casserole is so good and super easy to make. I love breakfast casseroles! I’ve had many variations over the years and I finally decided to put one with some of my favorite flavors down on paper and share it with all of you! 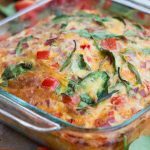 This breakfast casserole with ham is packed to the brim with colorful veggies and bursting with flavor. Oh and this recipe is as easy as you can get. To make this casserole, simply begin by washing and chopping your veggies. Now this recipe calls for lots of veggies, and although they all combine for an amazingly delicious egg casserole, if you don’t have all of them don’t fear! You can mix and match your favorite veggies! Use whatever you have on hand! Take the tomatoes, bell pepper, onion, spinach, and jalapeños (and any other veggies you want to throw in there!) and wash and chop them. Then in a large bowl beat 12 large eggs. I know you’re thinking 12! but trust me on this! Then stir in the seasoning, veggies, cheese and chopped ham. Pour this amazing protein packed concoction in a greased baking dish and bake at 350˚F for 30-40 minutes. Easy as cake… or should I say casserole! This recipe serves about 10 people, so make it for a group or eat the leftovers throughout the week! The nice thing about egg casseroles, besides the flavor and ease of them, is that they reheat well and taste delicious as leftovers. I really hope you guys enjoy this egg casserole with ham as much as I do. What are your favorite breakfast casserole combos? Let me know in the comments! If you want more easy breakfast recipes checkout our easy cinnamon french toast, blueberry streusel coffee cake or these easy and quick cinnamon rolls. This Ham and Egg Casserole is perfect for breakfast! 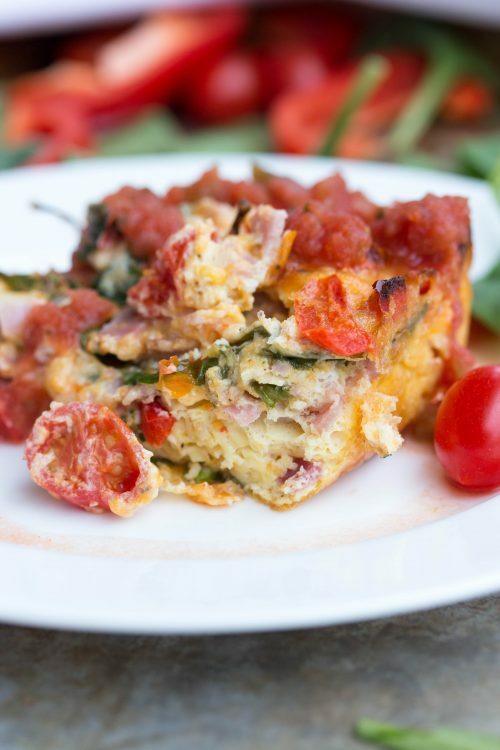 Pour a little salsa over the warm egg, cheese, and ham casserole for a delicious and filling kick off to your morning. Preheat oven to 350 degrees F. Lightly spray 8x8 glass baking dish with cooking spray. In a large bowl, combine all ingredients. Pour mixture into prepared baking dish. Bake for 30 to 40 minutes until center is firm and bouncy to touch. If you notice the bottom and sides are beginning to turn brown before the center is fully baked, reduce heat to 325 degrees F and bake for the remainder of time. Serve warm with salsa and enjoy!